From the first enquiry to after sales support, we pride ourselves on providing the right advice, exceptional service and a quality finish for every job we complete. 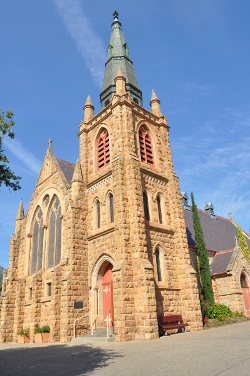 We were approached by the the Roman Catholic Church in Wangaratta for advice in how best to install new floor coverings in a church nearly 150 years old. 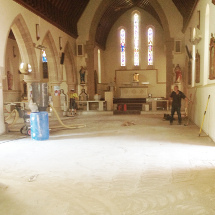 Bill discussed his ideas with the monsignor, including the logistics of moving 80 pews, removing carpet, underlay and under floor heating; and reinstating the carpet within a week. 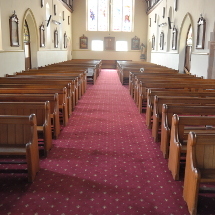 Bill also called upon resident interior designer, Marian Winter of Design House Interiors, to consult with monsignor on the colours and style of carpet that would best suit the current décor of the church. Following discussions between Bill, Marian and Monsignor, a beautiful Axminster carpet with traditional styled ‘fleur de leis’ pattern was put forward to replace the inadequate carpet installed 10 years before. 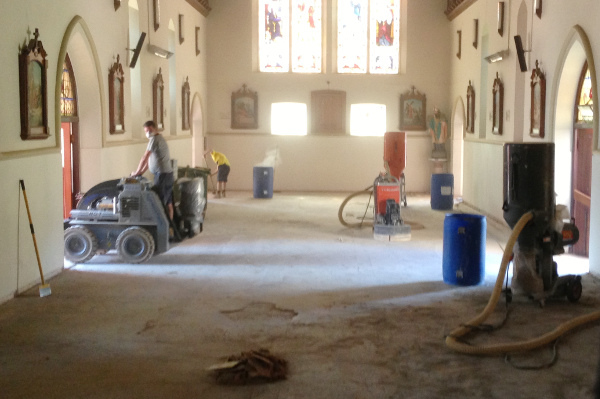 The Aggenbach team moved the pews, then proceeded to removed the carpet, underlay and floor heating. 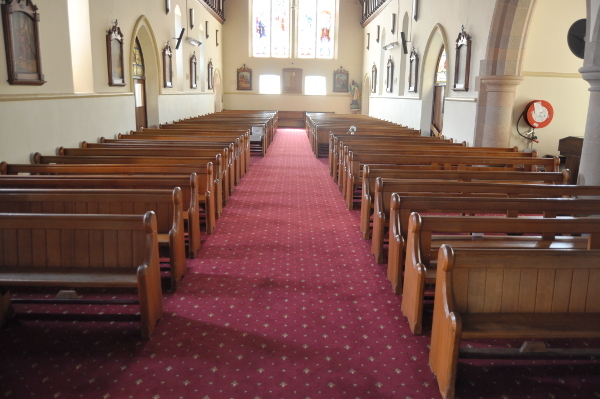 The new carpet was installed (modified to take new wiring for alter microphones) and pews replaced within the week timeframe given. Kate had vision to recreate a beautiful solid timber floor in Wangaratta in a new house she had bought to be closer to her family. Kate not only wanted the floor to look beautiful, but cost effective and more importantly embrace the ever important eco friendly factor of the modern world. Kate replaced existing carpet and vinyl that were both well past there expiry date. Timber was installed in the lounge, with the boards running down the longest part of the room to have it appear larger and more generous than before. As well as a new floor, a new kitchen was installed with the timber in mind. Here, false kick boards were installed over the floating timber floor to create a seamless effect. A woollen carpet in a sisal look was chosen, because it’s generous feel and long term capabilities. Andrew Gormly (head of the Wangaratta motor group) has had a long and strong association with Bill and the team; spanning from the time when he was a junior salesman, to where he is now – 7 dealerships in three locations. Andrews’s vision for the Wangaratta motor group dealerships was simple: clean lines, a modern feel, and (most importantly) to be practical. The installation, however, would not be so simple as the older buildings had many problems including multiple floor levels, cracked and dilapidated concrete slabs, and services bays with years of oil and dirt. Adding his own twist to guidelines established by head office, Andrew selected a variety of coverings including carpet tiles, laminate floating floors and tiles. 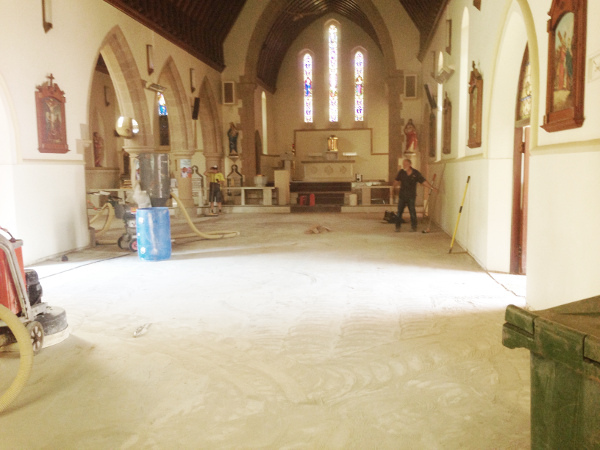 We re-levelled the old slabs using recently acquired machinery (a floor planer and profiler). 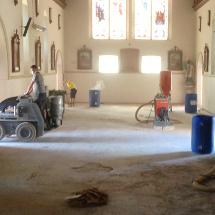 50mm drops were taken out of the floors, having been machine diamond ground to achieve a near perfect concrete floor. In the services bays we purged years of oil though a process of scrubbing then machine diamond grinding. Finally we installed a four coat system of epoxy floor. Andrew and his team are extremely happy with the work completed by Aggenbachs and will continue to work with them in future endeavours. To find out more please visit us at 20 Tone Road Wangaratta, or contact us on 03 5721 8900 or via our contact page. Get a free measure and quote today! On big jobs and small, we ensure the finish is second-to-none. In fact, we're so sure of it, we offer a lifetime installation guarantee*. But don't take our word for it, view our results for yourself!